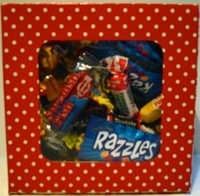 This cute red and white gift box is filled with all your favorite old time retro candy you ate as a kid. This is a mixed variety of old time favorites. Each box is 2 pounds and has approx 125 pieces of our variety mix. These are favorite candies from the 50's.